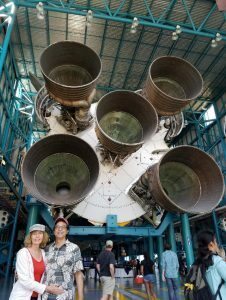 My wife and I had the privilege of visiting Kennedy Space Center a few weeks ago (see above). Yes, we are absolutely dwarfed by the massive Saturn V that sent three intrepid explorers to walk on the moon July 20, 1969. This “rocket garden” gives you a hint of the strategic plan to get to building the Saturn V. Every rocket—from the slight Vanguard, which launched America’s first satellite, to the Saturn IB, which was the predecessor to the Saturn V—was part of a strategic plan to learn what was needed to get man to the moon. These stepping stone rockets remind us that it took a specific plan to achieve the moon landing. When we see the math and engineering it required to test and build all the interconnected systems and processes to get those men to the moon and back, we begin to realize the careful planning and practicing that was required to make sure any contingency could be addressed. Then it struck me: just as it takes a living, breathing organism of teams to enable a business to fly up through success to significance, it also takes creating a specific kind of plan –a formal strategic plan--to enable the company owner to lead his team to fly his business through success to significance, or as we at American Business Advisors say, Creating Cash Cows® and Improving Quality of Life®. So how do you know that as an astronaut or a business owner, you have a strategic plan, which is sufficient to achieve your purpose? Let’s explore the essential elements of a formal strategic plan. Our company has a strategic plan. Your strategic plan should “work” no matter what changes in or around your business over time. A properly architected Formal Strategic Plan will also provide guidance for making decisions no matter what befalls your company. Question: Do you have the right plan? "Does it tie back to and support our purpose?" "Does it leverage our unique people, capital structure, and 'DNA' as a company?" "Does it stand the test of changing market or economic conditions?" "Can it withstand the loss of key employees, customers, or regulatory changes?"